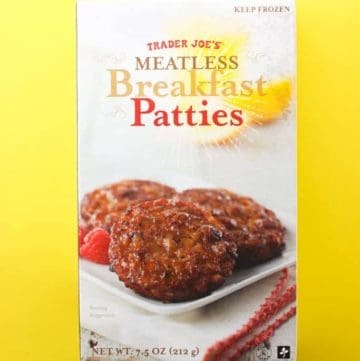 The pros: Trader Joe’s Meatless Breakfast Patties are a good alternative to meat sausage patties in the morning. The cons: True meat lovers probably will still want to stick with the real thing. 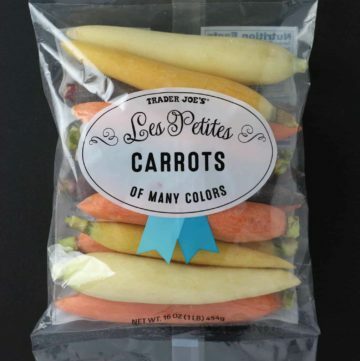 The pros: Trader Joe’s Les Petites Carrots of Many Colors are ready to go peeled and similar sized carrots ready to be roasted. 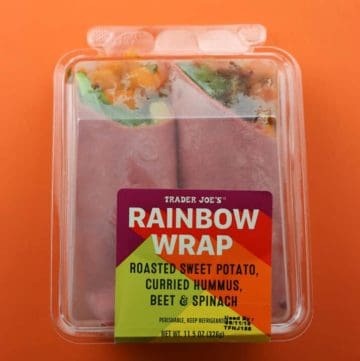 The cons: This item is pricey as compared to a very similar product called Carrots of Many Colors. You’ll want to put something under the carrots. The purple ones let go enough moisture that you would think a squid as on your pan. 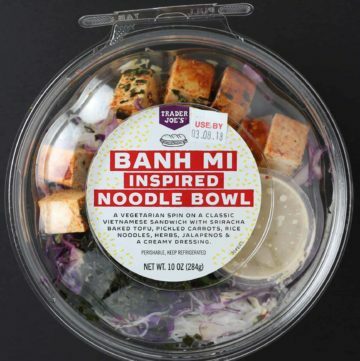 The pros: Trader Joe’s Banh Mi Inspired Noodle Bowl is a well done refrigerated item that manages to be fresh, filling, and not overly expensive. It is also a reasonable number of calories. The cons: My package was a complete pain to open. I almost ended up spilling it all over the kitchen in an effort to release the top from the bottom. 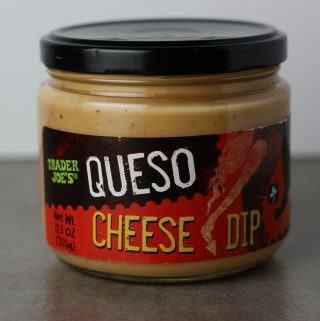 The pros: Trader Joe’s Queso Cheese Dip is a low-calorie dip that will partially satisfy your spicy cheese dip cravings. The cons: While low in calories, this makes sacrifices in other areas like thickness. This is a thin dip that is in no danger of breaking any chip that is placed into it. 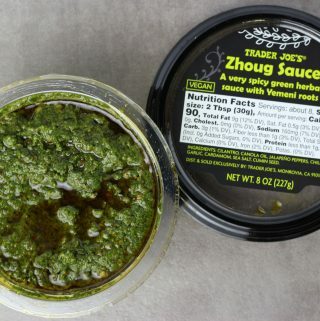 The pros: Trader Joe’s Zhoug Sauce is a new addition to the refrigerated dips and sauces at Trader Joe’s. 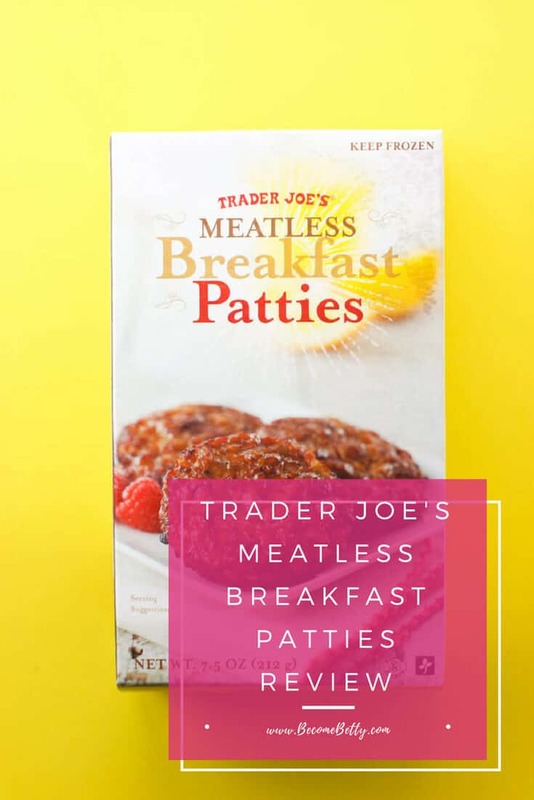 This product is also vegan if that is important to you. The cons: If you are sensitive to the taste of cilantro or cumin, then pass on the this sauce. The oil in this package is quite yellow and could possible stain anything it touches that isn’t treated right away. This is not a low calorie sauce. 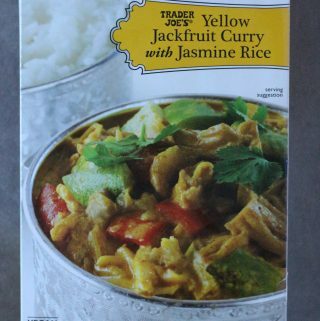 The pros: Trader Joe’s Yellow Jackfruit Curry with Jasmine Rice is the newest addition to the frozen foods aisle. Unlike so many of my recent posts, this item might not be seasonal. The cons: You’ll need to like yellow curry to appreciate this dish. Coconut milk drives up the saturated fat in this dish. 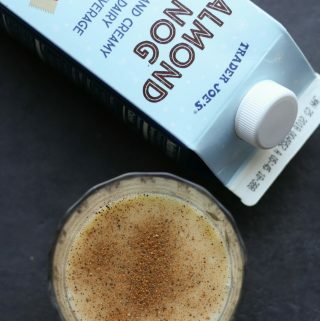 The pros: Trader Joe’s Almond Nog is soy free, gluten free, diary free, vegan, kosher, and seasonal. Best of all, it does a very good job of replicating the flavors that you might expect in a regular egg nog. The cons: Why is there not a recipe on this carton to make this boozy egg nog? Isn’t that what egg nog is supposed to be about? It’s also not quite as thick as a regular nog. 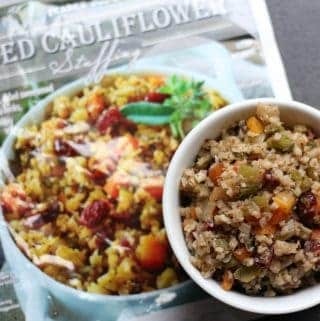 If there is one food item I look forward to at the Thanksgiving dinner table, it is stuffing. I’m not 100% convinced that stove top stuffing actually has THAT MANY servings in it. Stuffing goes quickly in my household. 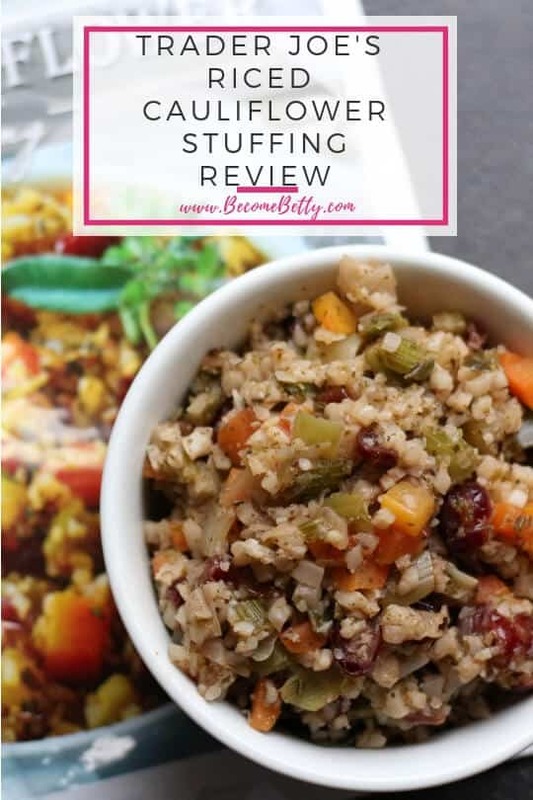 There is something completely comforting about the bread/veggie combo that stuffing is…. 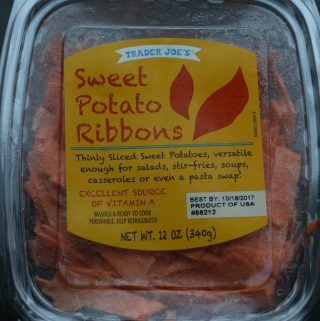 The pros: Trader Joe’s Sweet Potato Ribbons are found in the refrigerated section and are another substitute for pasta. The cons: With a little bit of prep, you could probably make these yourself. 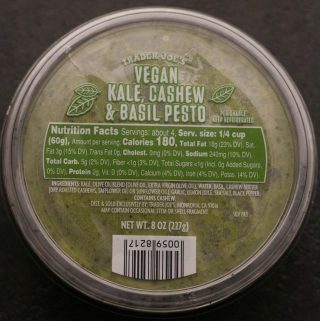 The pros: Trader Joe’s Vegan Kale, Cashew and Basil Pesto is excellent pesto that rivals homemade. The cons: Don’t let pesto’s green appearance fool you, this is not a low calorie sauce. 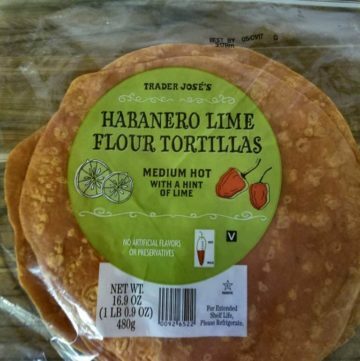 The pros: Trader Joe’s Habanero Lime Tortillas sound intimidating but they are flavorful and just hot enough. The cons: True spice junkies will likely be disappointed in the heat level in this product. I did not find this product to be very hot. They only come in the larger size. 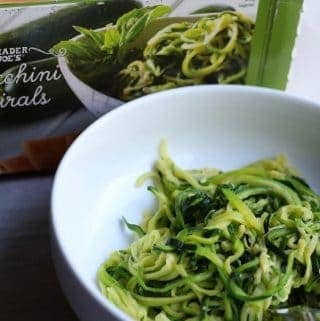 The pros: Trader Joe’s Zucchini Spirals are frozen, ready in about 10 minutes, and as easy as can be. 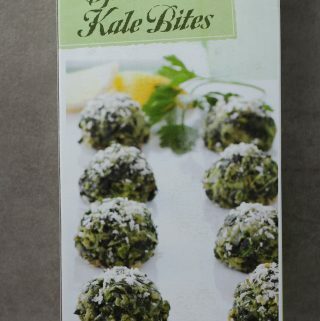 The cons: Trader Joe’s Zucchini Spirals gave up a lot of water, the box indicates that there are 4 servings and I ate the whole thing in one sitting, and is a bit expensive for what you are getting here. The cons: These are the real deal, so they can’t be rushed. 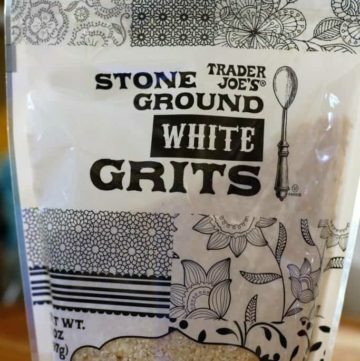 There are currently no quick grits or frozen grits available at Trader Joe’s. 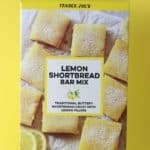 The pros: Trader Joe’s Taco Shells are a solid choice in the pantry aisle. 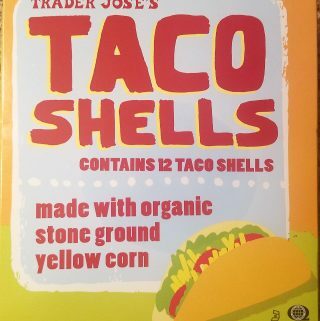 They make for good taco shells out of the box, but are better toasted per the directions. 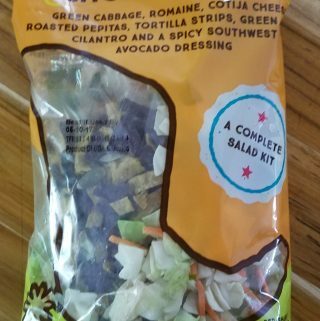 The cons: I wished the plastic wrapping was resealable. No fun or exotic flavors to speak of here. 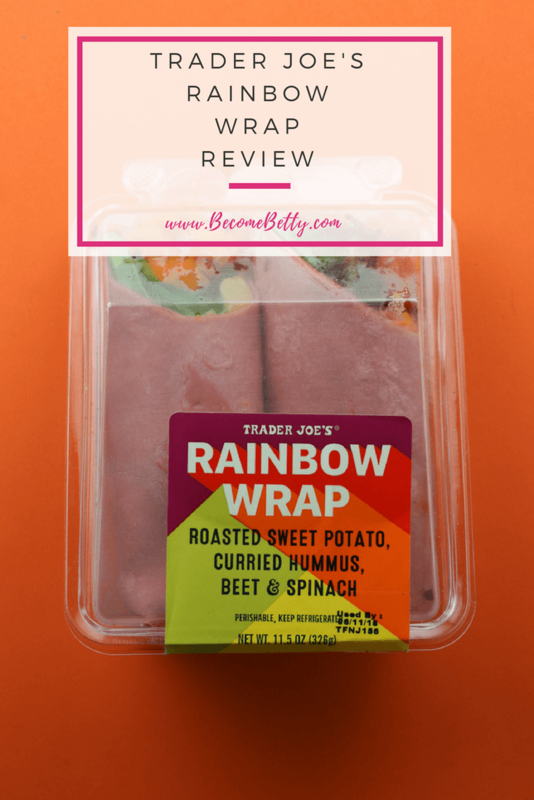 The pros: Trader Joe’s Southwestern Chopped Salad is a fun mix of flavors and some of which you might not have thought of throwing into a salad previously. The cons: Not enough dressing and you better like cilantro to appreciate this salad. Lots of little plastic bags are in this one package so it seems somewhat wasteful. 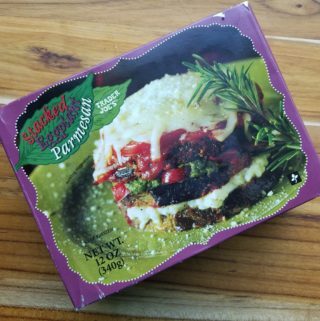 The pros: Trader Joe’s Stacked Eggplant Parmesan is a gem in the freezer aisle of Trader Joe’s. The cons: Not as cheesy as the picture would lead you to believe. Contents are enough for a single dinner. I probably could have eaten a tray of this. 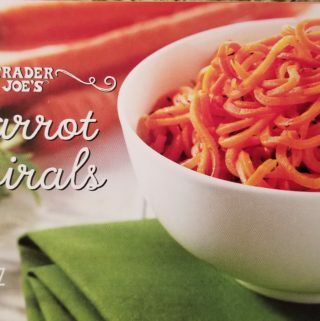 The pros: Trader Joe’s Carrot Spirals are the newest addition to the frozen veggies section. 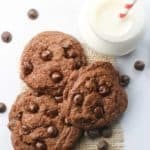 While it contains only simple ingredients, the end result was very good. The cons: On the other hand, this took longer to cook from frozen than the package stated. Also, a few spirals were very, very long. Be careful about overcooking these. 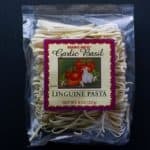 You do want al dente. 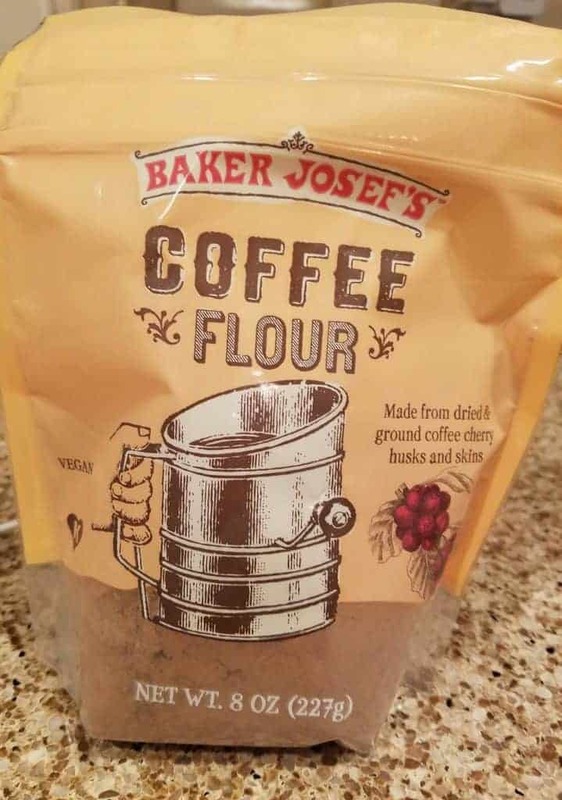 The pros: Trader Joe’s Coffee Flour has some good potential as it’s eco friendly and would be discarded. If you add 1 Tbsp to whatever you are making, it contains 6 grams of fiber. 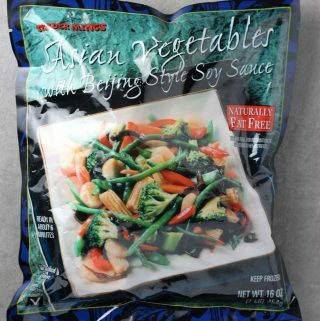 Very cool resealable bag that seems to utilize a Velcro like seal. The cons: Limited production of this item and even more limited number of suggested uses of this product. They included a few recipes, but not many. This is a half pound bag. 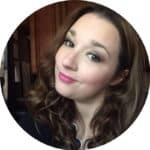 There will have to be a lot of consumer experimentation and I’m not sure most are willing to devote that much time to incorporating this one product. 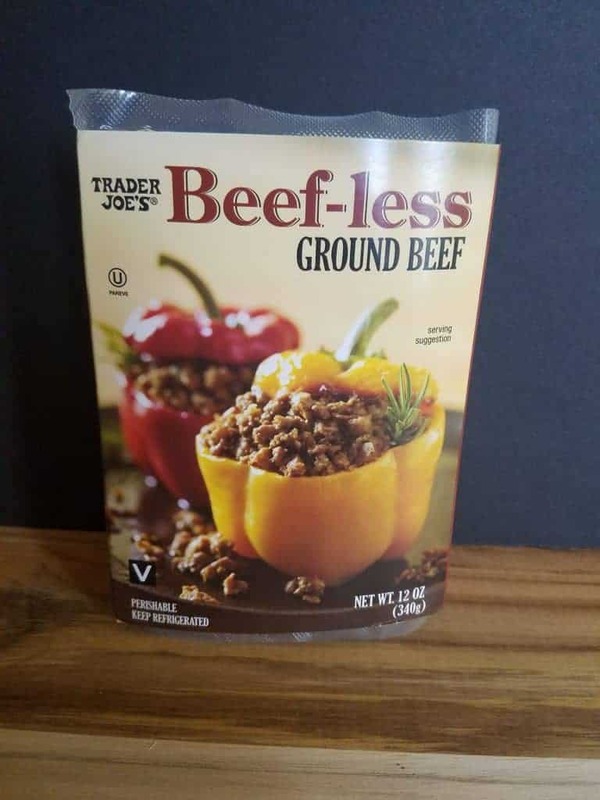 The pros: Trader Joe’s Beefless Ground Beef has a texture that is pretty close to ground beef. This is a blank canvas that will take well to your cooking abilities. This product does need your love an attention. The cons: This probably will not make a good “hambuger.” It needs something to be added to make this product better. Strongest flavor present is onions. 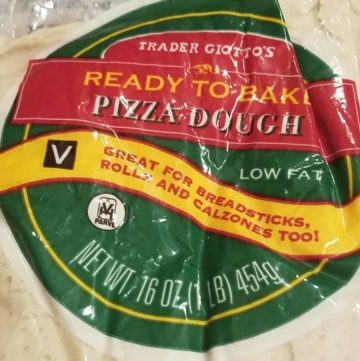 The pros: Trader Joe’s Pizza Dough is inexpensive, can be frozen and is a good item to keep on hand. The cons: Watch the shelf life. It’s a fresh item and won’t last forever. This item can be frozen if you are not going to use it right away. 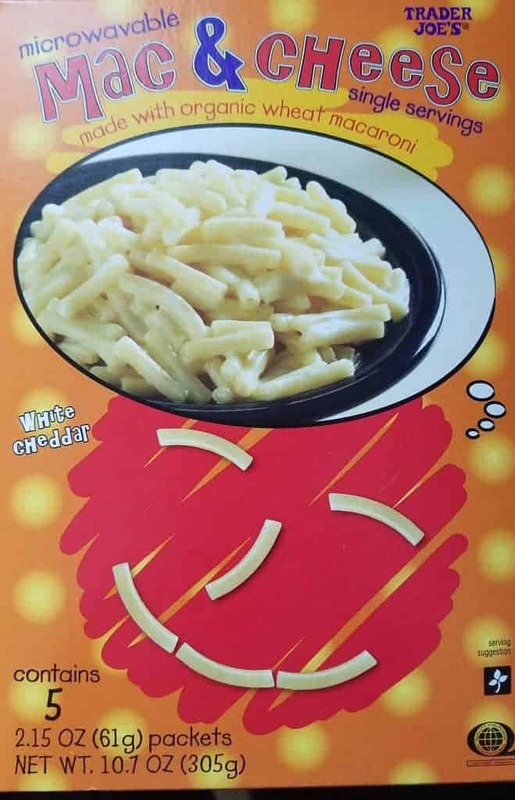 Velveeta and Kraft have nothing to worry about with Trader Joe’s Microwavable Mac and Cheese. 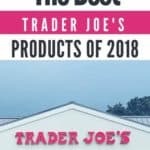 The taste of Trader Joe’s Microwavable Mac and Cheese was just ok. Most importantly, you’ll have to bring your own dish. 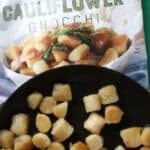 The pros: Trader Joe’s Microwavable Mac and Cheese is only 230 calories per serving. The cons: You might need to add additional water beyond what the instructions call for as my pasta came out dry every single time.